This was always a high priority Oregon destination for us, and is likely to be near the top of any review list of Pacific Northwest state parks. 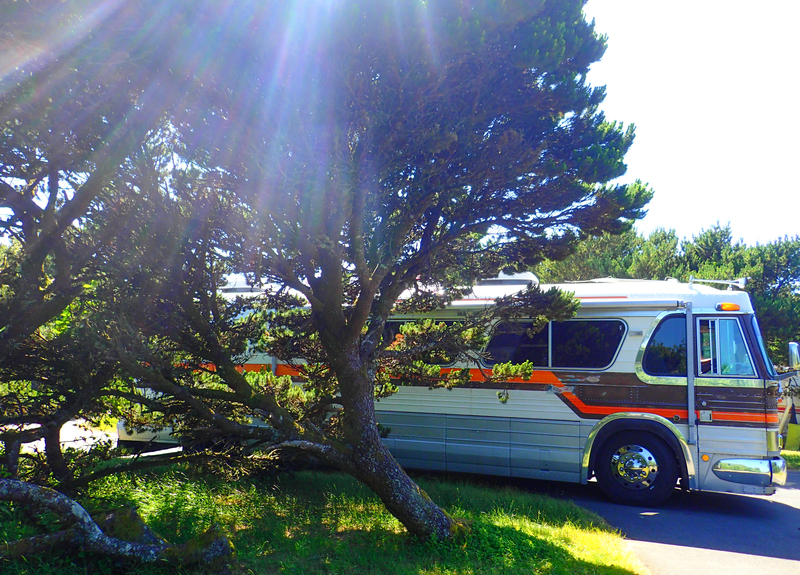 Like Cape Blanco, it is right on the ocean, but the beach experience is completely different. 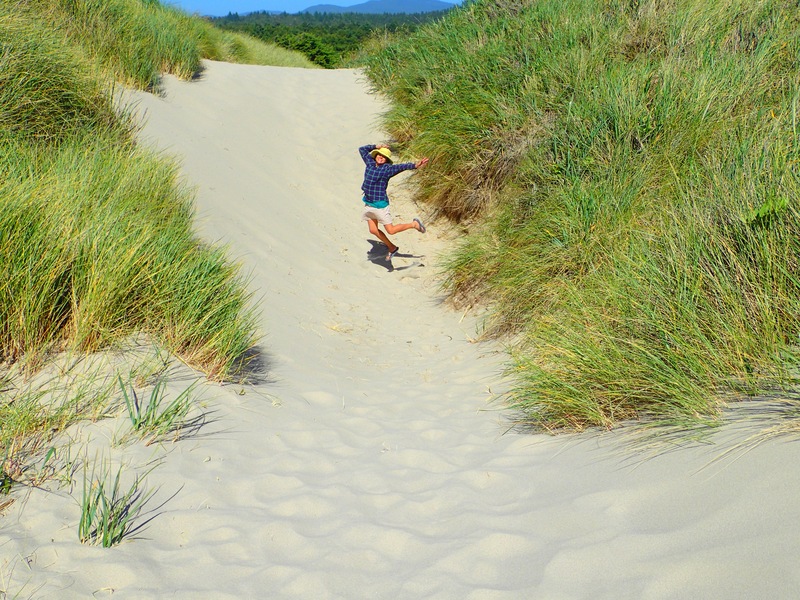 Rather than Cape B’s rugged green hills rolling down to low cliffs over the water, Nehalem is lower, with only a short lush tree line followed by couple hundred yards of large sand dunes and associated dune grasses separating our site from the ocean. The beach itself is much more… beach-like than Cape Blanco, with light fine sand. If it were not for the rugged coastline in the background, one could almost imagine being on the Florida Gulf Coast, perhaps St George Island. The RV spots were partial hook up, 30 amp power and water only, but they were level and very spacious with plenty of greenery between them. The roadways were well paved, each site came with a picnic table and fire ring. At $29 per night plus an $8 reservation fee, it was well worth it, as seems to be the case with most Oregon state parks. Contrast the full or partial hook up rates of Cape Blanco ($22) and Nehalem Bay ($29) with the drycamping cost in California’s McKerricher ($35) and Jedediah Smith state parks ($35). We loved both of the latter two, but the Oregon price structure is certainly to be appreciated. We had a fantastic and relaxing time here, and took full advantage of the clear if chilly in the evening weather, setting up our hammock and Rosemarie’s outdoor craft and jewelry station. She refreshed herself on Dremmel use and also started a shelled mirror project, while I supervised from a prone position. We finished the evenings with a fire and the clearly audible sound of the ocean a quarter mile away. One last note especially for any current or future camp hosts out there: This was the first and only park we have visited where a camp host drove around in his golf cart in the late afternoon and early evening selling firewood and meeting the guests. Most state parks, aside from those in high risk wildfire zones, have some sort of firewood sale system, but this method seems like a major win win. Sales and profit are surely higher, the camp host meets people, and the visitors receive a convenient firewood delivery service making their stay that much nice. After our fantastic experience volunteering at Cape Disappointment, we are looking into possibly camp hosting down the road, and intend to incorporate this little nugget into our sting if at all possible. Rosemarie found the ocean! Hurrah!